Nor does the use of this word by heathen or Christian Greeks, in the ages immediately succeeding apostolic times, encourage the idea of a changed import adopted by inspired penmen, which some vainly imagine. Any one maintaining this change of import in inspired writ, is bound to prove that, in one or more instances, the word is divinely used in another sense, the previous import (immersion) being certainly inadmissible. There is not such an occurrence. On Paedobaptist testimony, the immersion of “pots, cups, brazen vessels,” yes, of beds, was a Jewish custom, in order to cleanliness, or purification from ceremonial defilement. So also immersion on returning from the market, or from a crowd, and often by many before eating. Facts, on Paedobaptist testimony, prove that the rich Pharisee, who expected our Savior to baptize himself before eating, might have ample provision for immersion, and that the climate, clothing, and habits of Syrian Jews, made them ever ready for the practice of immersion without indelicacy or injury. Consequently the record of great numbers baptized by John, or by the disciples of Jesus, and the non-record as to whether or how they changed their garments, proves nothing against immersion. Bathings in the Jordan, now annually and more frequently taking place, testify its present suitability for immersion; nor can the idea that a river, flowing hundreds of miles, was either too deep or too shallow for immersion, be rationally entertained. The sufficiency of water and baths in Jerusalem, Samaria, and Damascus, for the immersion of those whose baptism in the oracles of God is recorded, has abundant Paedobaptist and every other acknowledgment. The baptism of Israel in the cloud and in the sea, and the baptism of the Spirit by Christ, are not literal baptisms in water. By the sea and the cloud unitedly the children of Israel were covered. That the disciples as to their bodies, on the day of Pentecost, were not encompassed with the emblematic fire, is incapable of proof, while all admit that their souls were, as it were, immersed in the divine Spirit. The fulfillment of a predicted and abundant pouring might therefore constitute an immersion as to body and soul, or that which by no other word can be more properly designated. A prediction of the sprinkling of water, or pouring out of the Spirit by the divine Being on men, is no proof that the word which in the New Testament describes the divinely enjoined action of man towards man, is either sprinkling, or pouring, or immersion. The expression of Peter, “Can any man forbid water?” cannot be proved to mean more than, “Can any man forbid baptism?” nor dare any who are regardful of truth affirm that the jail at Philippi was not, like other Eastern jails, supplied with a bath. If inspired writers had used the Greek word in another sense, surely the practice among Christians of immediately subsequent times would have corroborated this. But neither the Greeks, who are supposed best to understand their own language, nor the Latins, nor any barbarians, afford the slightest support to a supposed alteration by divine or any other warrant of the import of baptizo and the words derived from it. Nor does Jewish proselyte baptism, whether it originated before, or, as many eminent Paedobaptists believe, after apostolic times, give the least countenance to anything short of immersion as baptism. The first recorded departure from immersion for baptism is an acknowledged deviation — an acknowledged imperfection — which, it was believed, required God’s mercy and special necessity for its adoption. This took place at about the middle of the third century. Baptism was then believed requisite in order to have the certainty of salvation. A dying man might be incapable of being baptized. A substitute for baptism in such circumstances was admitted, with allowed disadvantages if life should be spared. This at length has been palmed off as baptism, as the very thing that God requires, or all that from any he demands! And while there is such a cross in being once immersed for Christ’s sake, especially in these cold and northern regions, the convenience and decency of sprinkling are lauded to the skies. And by some who speak of immersion as if it could not be performed without a breach of delicacy, it is maintained that immersion is one of the actions embraced in the word divinely chosen when “baptizing” is enjoined. On the subjects of baptism greater length, and some reference to our worthy author’s erring assertions, are requisite. The divinely approved subjects of Christian baptism can be ascertained only from the New Testament. Christ’s commission, confirmed as to its import by previous and especially by subsequent practice, and by every reference to this ordinance in the oracles of God, is “the law,” and “the testimony.” An attempt to prove the rightful subjects of Christian baptism from God’s word and Jewish proselyte baptism, is to imitate the Popish appeal to Scripture and tradition. Besides, no man upon earth knows that proselyte baptism had an existence in apostolic times, while every one may know that its origin is “of men,” not “from heaven;” and that the Bible alone is man’s rule of faith and practice. Every legitimate inference from every part of Holy Writ we admit. We maintain the sufficiency of the first Scripture, independently of the latter, on which we lay not stress in this controversy, knowing that in some manuscripts it is wanting, yet believing with almost all our opponents, that it belongs to the word “by inspiration given.” The first quoted passage, the commission of Christ for the guidance of his disciples, “unto the end of the world,” does not say, first disciple, and then baptize, and then teach to observe all things, etc. ; but that this is its import we maintain, from the construction of the entire precept, from what the apostles had before witnessed and practiced, from their subsequent practice, and from every reference to baptism in their writings. In understanding this passage, if we follow order, where above all places the most precise order might be expected, we must understand Christ’s will to be, that we first make disciples, then baptize, etc. That order is not here to be regarded it devolves on the opponents of order to prove. In making disciples, the communication and the acceptance of truth, the teaching and the receiving of the good news, are requisite. After this and baptism, teaching is not to cease, “teaching them to observe all things whatever I have commanded you.” Nor is there anything in the passage demanding another interpretation. It has indeed been said, that “them” after “baptizing” has “all nations” for its antecedent, that the discipling and baptizing are of equal extent, embracing the same persons, even every individual in all the nations; but that the discipling of all nations means the discipling of infants is no more apparent than that infants are included where we are taught that all nations shall call our Redeemer blessed, or when he predicted, “You shall be hated of all nations.” Nor is the antecedent, as maintained, although grammatically admissible, a grammatical requirement. Also, “that the inspired writers, any more than other men, do not use the pronouns with such scrupulous exactness, is manifest” from an examination of the New Testament. It is however maintained, and by some who denounce immersion as inconvenient and dangerous, that the commission teaches that we are to make disciples by baptizing and teaching, these present participles, following the command to disciple, certainly including the accomplishment of the discipling, and necessarily involving a contemporaneous act. The word “by” is however no more in Christ’s words than are firstly and secondly. The word “by,” though frequently admissible in such sentences without obscuring or altering the sense, is also frequently inadmissible, as involving the most obvious perversion of a writer’s meaning. No one will doubt on reading, “He spoke, saying,” etc., or, “They cried, saying,” etc., that the speaking or crying is accomplished by saying; but when we read, “The men marveled, saying” (Matthew 8. 27), does any one doubt that the marveling preceded and caused the saying, and that the marveling was not accomplished by the saying? When our Savior said, “Lend, hoping for nothing again” (Luke 6. 35), did he mean that the lending would be accomplished by hoping for nothing again? When we read, “Then came to him a man, kneeling down to him” (Matthew 17. 14), do we understand that the coming to Christ was accomplished by kneeling, or that the kneeling was contemporaneous with the coming? No rule demands this absurdity. A thousand instances of such a construction in our own and the Greek language could be adduced as disproving the necessity of so understanding Christ’s words. Nor is there a noted Paedobaptist commentator, or controversialist, whom we remember, who does not interpret baptism into the name of Father, Son, and Spirit, baptism into Christ, or into Moses, as involving a profession and consecration; which interpretation necessarily excludes infants. 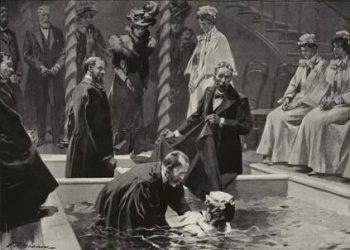 Dr. Martensen says that “baptism, as a human ceremony, is an act of confession, by which a person is admitted into Christ’s church;” that “the sacraments, as acts of the church, are chiefly to be viewed as acts of profession (notoe professionis), visible, sensible acts, by participating in which, each person indeed confesses his Lord and the church.” Mr. Watson says: “That Christ is formed in us (Galatians iv. 19); that our nature is changed; that we are made holy and heavenly; this is to be baptized into Jesus. Romans 6. 3.” He further speaks of an “oath of allegiance” which we make to God in baptism. Yet it is also said by him on Christ’s commission, “The Greek is, ‘Make disciples of all nations.’ If it be asked, how should we make them disciples? it follows, ‘Baptizing them and teaching them.’ In a heathen nation, first teach, and then baptize them; but in a Christian church, first baptize, and then teach them” (p. 380). Not only has Christ given no intimation of two ways of discipling, not only do the inspired writings contain no record of apostolic discipling in two ways, but the very records of discipling and baptizing the heathen, as at Philippi and Corinth, are the records from which our opponents advocate their first baptizing and then teaching. We admit that in accordance with human phraseology, the word “disciples” is used in Scripture in application not only to those who were really, but also to those who were professedly disciples. Yet assuredly the Savior did not wish his apostles, nor does he wish us, to make hypocrites; although not having access to the heart, we may sometimes baptize the unworthy, as Philip baptized Simon. This inevitable fallibility we deem no more condemnable in ourselves than in the evangelist. From this necessary weakness of humanity, we may not only sometimes receive the unworthy to baptism and the Lord’s Supper, but may also induct such into the highest office in the church of Christ. We are not justified for this reason in altering the import of a disciple of Christ, solemnly and explicitly given by the Savior himself. The tendency of paedobaptism, as we could clearly show, is to pervert the import of a disciple of Christ, by teaching that an unconscious babe, that a child who can answer certain questions, yes, that a man or woman known to be ungodly, may, by baptism, become a disciple of Christ! Thus while certain conformists, maintaining justification by faith, are inconsistently teaching that baptism regenerates and converts into a child of God, certain nonconformists, maintaining the divine truth of salvation by grace through faith, teach that baptism disciples to Christ! A correct interpretation of discipling excludes infants from the commission. According to this natural import of Christ’s words, namely, that we are to disciple to him, to baptize into the name of Father, Son, and Holy Spirit, and to teach obedience in all things to Christ’s commands, we further conceive the apostles must have understood Christ, on account of the baptism they had already witnessed and practiced. They knew not, so far as we are aware, any other baptism than John’s, and that of Jesus through themselves. Were we to bind with the Bible all the Rabbinical lumber and all the condemned (or approved) Jewish traditions that the world contains, we should, while dishonoring the sufficiency of inspired writ, be in the same destitution of evidence that the apostles knew of any other baptisms than those recorded in the oracles of God. John “baptized with the baptism of repentance, saying unto the people, that they should believe on him who should come after him, that is, on Christ Jesus, (Acts 19. 4.) They “were baptized of him in Jordan, confessing their sins.” (Mark I. 5.) It was a baptism “into repentance,” as this was the state professed by them while confessing their sins and being baptized. Until our Lord’s commission, the Scriptures speak of no baptism from heaven in addition to John’s, except that of Christ by means of his disciples. Concerning this the inspired record is, first, that “He baptized” (John iii. 22), and secondly, that “He made and baptized more disciples than John, though Jesus himself baptized not, but his disciples.” (John iv. 1, 2.) He baptized disciples. He made AND baptized them. The instruction from this baptism can only be in favor of first making disciples, and then baptizing them. The whole of divine revelation respecting every baptism from heaven which the apostles had previously witnessed or practiced, confirms our belief that they would certainly understand Christ’s words according to their natural import already indicated. The next baptisms on record are those at Philippi and Corinth, adduced by Mr. Watson as proving that the apostles, in baptizing “whole families,” baptized “little children” and “servants” (p. 381). We admit that, in Lydia’s case, we have the record that “she was baptized, and her household,” and the previous record respecting her, “whose heart the Lord opened, that she attended unto the things which were spoken of Paul,” while nothing is said respecting the character of “her household.” This proves not that Lydia had either husband or child. The household of this “seller of purple, of the city of Thyatira,” might consist wholly of servants. Silence here neither proves nor confirms anything in favor of paedobaptism. Having no record respecting the character of this household, we are bound to believe that apostolic practice here accorded with previous and subsequent apostolic practice. The next baptism, that of the jailor “and all his,” is one from which infants are clearly excluded. Paul and Silas “spoke unto him the word of the Lord, and to all that were in his house;” and after baptism, “he set meat before them and rejoiced, believing (having believed) in God with all his house.” The next record is equally explicit, and opposed to the baptism of infants or unbelievers. “And Crispus, the chief ruler of the synagogue, believed on the Lord, with all his house; and many of the Corinthians hearing, believed, and were baptized.” The baptism of “certain disciples” at Ephesus, of whom we read, “And all the men were about twelve,” equally refuses its aid to the baptism of infants; while “the household of Stephanas,” of whom Paul says, “They have addicted themselves to the ministry of the saints,” cannot be brought to the rescue of our opponents. Arguments from references to baptism in God’s word are as futile as those from precepts and examples in favor of baptizing infants. The apostle of the Gentiles appeals to all the “saints” in “Rome,” that as “dead to sin,” they had been “baptized into Jesus Christ,” “baptized into his death,” and “buried with him by baptism into death.” Their having been baptized demanded that they “should walk in newness of life.” Is this applicable to infants? To the churches of Galatia he wrote, “For as many of you as have been baptized into Christ, have put on Christ.” Of the Colossians he writes, “Buried with him in baptism, wherein also you are risen with him through the faith of the operation of God, who has raised him from the dead.” The last mention of baptism is by Peter, who speaks of baptism as “the answer of a good conscience toward God.” Thus condemnatory of paedobaptism is the entire New Testament. “How does it appear that children have a right to baptism?” we read, “Children are parties to the covenant of grace. The covenant was made with them. ‘I will establish my covenant between me and you, and your seed after you, for an everlasting covenant, to be a God unto you, and to your seed after you.’ Genesis 17. 7. ‘The promise is to you and to your children.’ The covenant of grace may be considered either, 1. More strictly, as an absolute promise to give saving grace; and so none but the elect are in covenant with God. Or (2.) More largely, as a covenant containing in it many outward glorious privileges, in which respects the children of believers do belong to the covenant of grace,” and “cannot justly be denied baptism, which is its seal. It is certain the children of believers were once visibly in covenant with God, and received the seal of their admission into the church. Where now do we find this covenant interest, or church membership of infants, repealed or made void? Certainly Jesus Christ did not come to put believers in a worse condition than they were in before. If the children of believers should not be baptized, they are in worse condition now than they were in before Christ’s coming” (p. 380). In this extract from Watson, God’s gracious covenant with Abraham, or one of God’s covenants with him, is styled “the covenant of grace.” But the covenant of grace commenced with Adam, whether we restrict it to “the elect,” those chosen to salvation, or regard it “more largely” as referring to “outward glorious privileges.” Again, God’s covenant with Abraham was not a covenant with the elect of mankind, nor with the whole race, nor with Abraham and the elect descending from him, nor with Abraham and exclusively the children of believers, nor with any children for the sake of their parents, excepting Abraham’s own children. Nor can the Pentecostal promise of Peter be proved to have any connection with, or reference to, the Abrahamic covenant, admitting that, as some promises resemble others, this and the immediately following may remind us of the predictions that in Abraham and his seed all the nations and all the families of the earth shall be blessed. That all Abraham’s descendents were elected to salvation no one believes; nor is it less apparent that the children of wicked parents received the token of the covenant, as well as the children of believing parents; and in every instance beyond that of Abraham’s children, not from filial relationship, but from relationship to Abraham. “The sons of David,” as says Dr. Halley, “were circumcised according to the same law, and therefore, for the same reason as the sons of that worshiper of Baal, Ahab, and of that wicked woman, Jezebel.” Nor was the covenant of God with Abraham and his seed a covenant with his seed as infants, but with his descendants. If the token of the covenant had been disobediently neglected, it might at any age, and irrespective of character in its recipient or the parent, be performed from relationship to Abraham. Not one of Abraham’s natural seed is another Abraham, nor is one believer. But all believers may be spoken of as the (believing) children of faithful Abraham. That God graciously entered into covenant with all Abraham’s descendants for his sake, and instituted a sign to be fixed on every male, is no evidence that God has entered into covenant with the natural children of every believer, and with each child for the parent’s sake, and that the baptism of male and female infants of believers is the appointed sign of this covenant. Where is such a law but in the writings of Paedobaptists? The “covenant interest” of “the children of believers” as such, or of ” infants” of believers, or the “church membership of infants,” and “the seal of their admission into the church,” giving to the word “church” any idea resembling its New Testament use in application to the church, or a church of Christ, needed not to be “repealed or made void,” because they had never existed. If God’s covenanting with Abraham and his seed, and instituting the sign of circumcision in males, proves the church membership of the seed of Abraham, it proves an Ishmaelitish as well as an Israelitish church of God, and a church to which ungodly adults, equally with the infants of believers, belonged. If circumcision is the seal of admission into the church, there has been not only a Jewish church, but an Edomite, a Moabite, an Ammonite church. Did Episcopalians and all others who believe a church of Christ to be “a congregation of faithful men,” always speak consistently with this, we should hear less of any nation at any period, or of any building in any place, as a church. Why should we not, except where the idea of assembly exists, after the manner of inspired writers, speak of those who anciently enjoyed the divine favor, as saints, as the people of God, as those that feared the Lord, as the righteous, etc., instead of confoundingly speaking of the church before the flood, the patriarchal, the Abrahamic, the Mosaic, the Jewish (etc.) church? There is not however the slightest intimation in God’s word that “the children of believers,” or “the infant seed of believers,” in distinction from the children or infant seed of unbelievers, constitute or belong to “the election of grace.” The attempt to found such an hypothesis on the covenant with Abraham and his seed, requires the belief that grace is hereditary; that all Abraham’s posterity were in infancy the children of God and heirs of heaven through their relationship to Abraham, whatever their subsequent piety or ungodliness, salvation or damnation; that divine grace through Abraham naturally and efficaciously descended through all his seed, or, if it is preferred, through all his seed in the line of Isaac and Jacob, until the coming of Christ, when the infant seed of believers have the same “claim to the covenant of grace as their parents; and having a right to the covenant, they cannot justly be denied baptism.” What inference is possible from this reasoning, but that the infant seed of all from Abraham to Christ, who descended not from Abraham, were heirs of hell? and that it is now, and from the time of Christ has been, the condition of all infants having unbelieving parents? Besides, unless circumcision introduced into the covenant of grace, or confirmed spiritual blessings, or promoted spiritual along with its temporal good, and unless the baptism of infants secures temporal or spiritual good to the same extent, which also the lack of baptism by infants prevents, the implied retaining of the same blessings since by baptism, and the inferred diminution of blessings by the omitted infant baptism, fall to the ground. We might also inquire of some, Can the blessings of the covenant, to those born in the covenant, and who have its blessings signed and sealed to them, slip out of their hands? It has probably been reserved to Dr. Bushnell, while saying many good things on parental influence and obligations, in advocating the baptism of infants, to carry filial relationship and its effects to their most absurd and monstrous extent. He teaches, in his Christian Nurture, that “until the child comes to his will, we must regard him still as held within the matrix of the parental life” (p. 97); that the covenant with Abraham “was a family covenant, in which God engaged to be the God of the seed as of the father. And the seal of the covenant was a seal of faith, applied to the whole house, as if the continuity of faith were somehow to be, or somehow might be, maintained in a line that is parallel with the continuity of sin in the family” (p. 106); that “the old rite of proselyte baptism, which made the families receiving it Jewish citizens and children of Abraham, was applied over directly to the Christian uses, and the rite went by ‘households'” (p. 107); that by “organic unity in families,” we have “the only true solution of the Christian church and of baptism as related to membership” (p. 108); that “baptism is applied to the child on the ground of its organic unity with the parent, imparting and pledging a grace to sanctify that unity, and make it good in the field of religion” (p. 110); that the child “is taken to be regenerate, not historically speaking, but presumptively, on the ground of his known connection with the parent character, and the divine or church life, which is the life of that character” (p. 110); and “that the child is potentially regenerate, being regarded as existing in connection with powers and causes that contain the fact before time, and separate from time” (p. 110). Thus the “seal of faith” has belonged to infants and unbelievers, and now belongs, and is restricted to, believers and their children! If Jewish “proselyte baptism” is made “over directly to the Christian uses,” this is, of course, taught in God’s word, or we are expressly or by implication taught, that the Jewish Talmud, a Rabbinical composition of the third century of the Christian era, belongs wholly, or in some specified part, to the oracles of God! We deny not “an organic unity” in any man, or any animal, having head, heart, lungs, liver, etc. ; nor do we deny a union between Christ and his people, so that he lives in them; but we deny a union between children and parents, so that when father or mother is converted, the child becomes a “new creature,” or becomes then, and not before, “potentially regenerate.” We maintain that man becomes potentially regenerate, not through organic unity with any believing man, but as belonging to those for whom God has instituted an economy of grace, no man becoming potentially regenerate but through the sacrifice of the Son of God, which atones for sin and secures the bestowment of the divine Spirit. Well may Dr. B. piteously exclaim on his “doctrine of organic unity,” “as a ready solvent for the rather perplexing difficulties of this difficult subject,” that “one difficulty remains, namely, that so few can believe it” (p. 111). There is as much evidence that a child is baptized in the baptism of the parent, as that it is regenerated in the regeneration of the parent; yes, that the whole life and character of the child, and its eternal salvation or damnation, are that of the parent. We believe that the circumcision, not only of male adults, but of male infants, was divinely enjoined, and that the unconsciousness of the latter constituted no hindrance to an accomplishment of the design of this institution; and we doubt not God’s right, if he had seen it good, to institute a rite under the Christian dispensation that should embrace the unconscious, both males and females; but we deny the shadow of evidence that he has so enacted. The existence of circumcision from Abraham proves it not. Nor are we taught that baptism is in the place of circumcision, although in some things there is a resemblance in one to the other. The antitype of circumcision, or spiritual, Christian circumcision, is the renewal of the heart. Romans ii. 28, 29; 1 Corinthians 7. 19; Galatians 6. 15; Philippians iii. 3; Colossians ii. 11. The apostles and elders gathered together in Jerusalem, to consider the necessity of circumcision, which some of the baptized Jewish believers maintained, drop not a single hint to the erring, that baptism is in place of circumcision. The apostle of the Gentiles, warning the Colossian believers, and rebuking those in the churches of Galatia who held the destructive error, instead of teaching that baptism occupies the place of circumcision, teaches that Christian circumcision, the circumcision of Christ, is a circumcision “without hands, in putting off the body of the sins of the flesh.” Nor is there in the fact that all children, or all the children of believers, are of “the kingdom of God,” a particle of evidence that God has commanded their baptism. The Scriptures which speak of baptism, recording its appointment, its practice, its nature, design, or benefit, are those from which its divinely approved subjects can be learned. These speak of confession of sin, repentance, faith in Christ, discipleship, a good conscience, as characteristic of the baptized. Not a word is recorded respecting parents or others as proxies for “the child’s personal engagement” (p. 381). Ourselves, our children, and all we possess, are God’s property; and with all, as “his servants,” God has a sovereign right to deal. The duty of baptism is not learned from this fact, but from the revelation of God’s will. The apostle Paul, speaking of the marriage bond, when one partner has become a Christian, and the other remains an unbeliever, teaches a sacredness in the children and the unbelieving partner that forbids a dissolution of the connection; but, while attributing the same holiness to the children and the unbelieving partner he says not a syllable implying a “right and title to baptism” (p. 382). Everything really included in parental dedication is as much the privilege of the Baptist as Paedobaptist. It is a benefit to the child when no deceptive substitute has been performed on him, preventing, or helping to prevent, his personal, conscious, voluntary, and acceptable obedience to God’s command. The obtaining by infants, through baptism, of entrance into the church, of “a right sealed to the ordinances,” that is, to the Lord’s Supper, etc., and of “the tutelage of angels to be the infant’s lifeguard,” may be in the imagination of Paedobaptists; but these are not in the word of God, any more than that baptism is to elected infants “a ‘seal of the righteousness of faith,’ a layer of regeneration, and a badge of adoption” (p. 380). Not only are the Scriptures silent respecting infant baptism, but every record relating to baptism, forbids its existence in apostolic times, and its right to a subsequent existence. Nor does Irenaeus, or any of the earliest fathers, say one word favoring the supposition of its existence, notwithstanding the inference that is drawn by some of the Paedobaptists from one passage in Irenaeus. What authority has a practice that can but be proved as possibly beginning to exist at the close of the second, or in the early part of the third century? For Tertullian, dissuading from the baptism of children, may not refer to infants. The existence of infant baptism in the third century is certain. The existence in the third, and in the preceding century, of sentiments on the efficacy of baptism, and of various practices which have no foundation in Holy Writ, is easily and abundantly proved. But neither infant baptism nor any other practice could be sanctioned by evidence of existence in the age immediately succeeding the apostolic period, or existence in apostolic times, if destitute of apostolic sanction; and especially if opposed to, and destructive of, what is divinely enjoined. The fact that inspired writers, in recording baptisms, except where the baptism of parents and other members of the family take place at the same time, say nothing as to parental piety, accords with and corroborates our view of baptism as a personal and voluntary profession and engagement. Every record of baptisms in Holy Writ, and every reference to baptism, is a confirmation of believers’ baptism as the “one baptism” for parents and children, for every generation, and for all alike, to the end of time. Instead of exalting believers’ baptism above measure, we say in the words of our honorable and Rev. 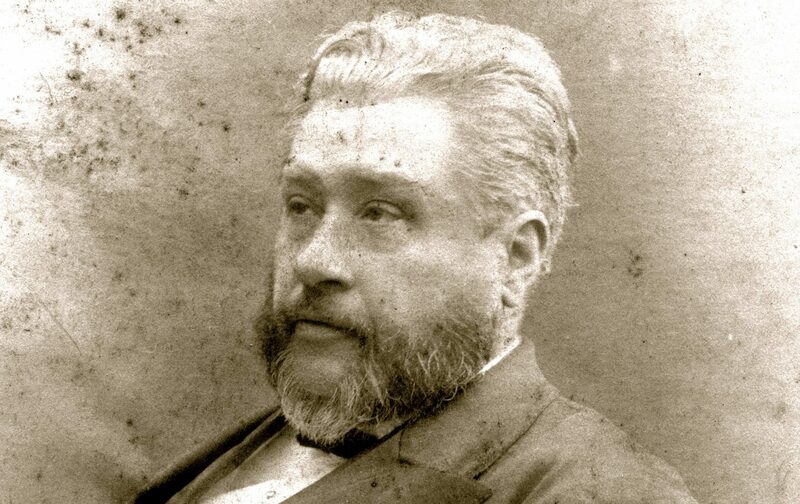 brother Noel, “It is not separation from the church of Rome, or from the church of England, nor a scriptural organization, nor evangelical doctrine which can alone secure our Savior’s approbation.” They who speak of infant baptism as a putting of the child’s name in a will by the parent, need to be reminded of God’s prerogative, and of the character of his government as revealed in the words: “All souls are mine; as the soul of the father, so also the soul of the son is mine: the soul that sins, it shall die.” Who, believing this testimony, can also believe that unbaptized infants are “sucking pagans,” while those kindly baptized through parental influence are sucking Christians?